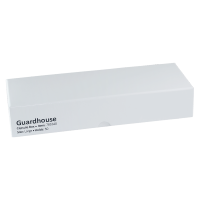 大Guardhouse空胶囊盒 Glossy white cardboard with black velour slots. Each Large Guardhouse holds up to 50 coins (two rows of 25) encapsulated within 38 mm, 39 mm or 40 mm coin capsules. Each slot has a maximum width of 5.5 mm. A great way to store and organize your investment!